It sort of seems like everywhere I turn these days, I'm seeing photos of creative uses for cupcake liners. I love turning the ordinary (and cheap!) 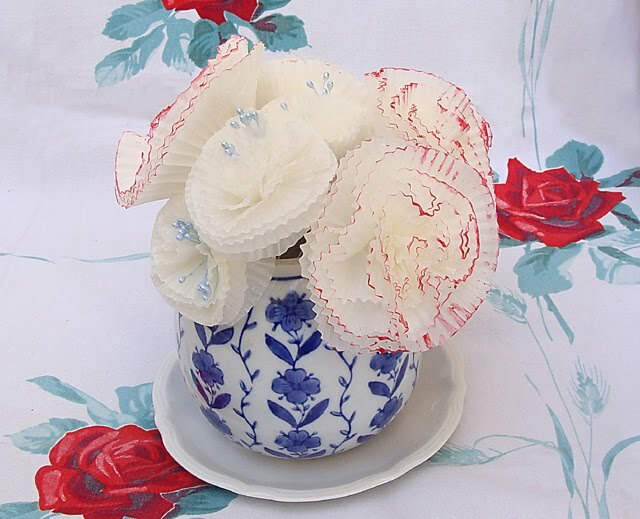 into something really pretty, and cupcake liners are a great way to do just that. They are readily available at stores such as Walmart, Hobby Lobby and Michaels.... even grocery stores. And if you don't see what you like there, the internet has an absolutely mind-boggling amount of choices. Two of my favorite sites to find unique cupcake liners are Bake it Pretty and Sugarcraft. 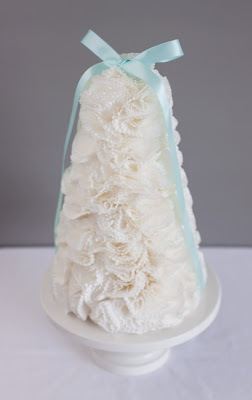 Intimate Wedding has a tutorial on these sweet cupcake liner flowers. These would make beautiful and inexpensive party table centerpieces. 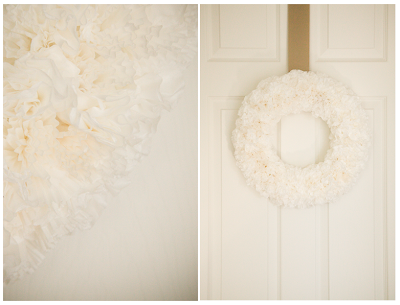 And this wreath from Sarah Faubus looks just like carnations -- so pretty! 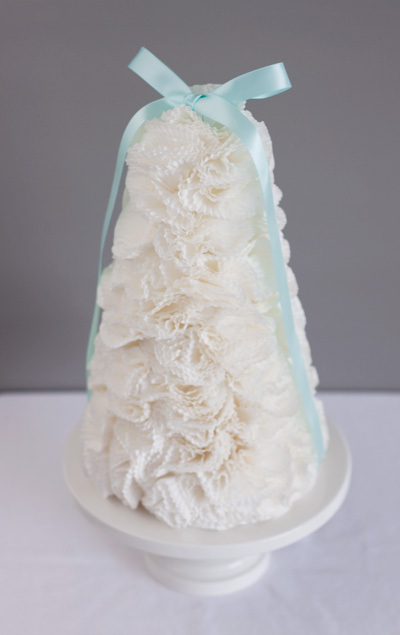 Paper Crave has a wonderful topiary tree made from cupcake liners as well. 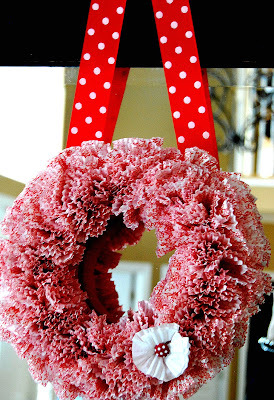 Tater Tots and Jello has another simply gorgeous Valentine wreath -- with a tutorial! 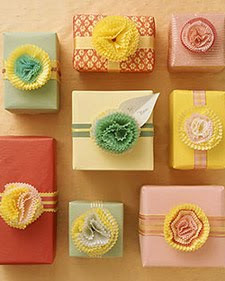 Martha Stewart uses cupcake liners to make carnation-like decorations for gift wrapping -- what a great idea. I love the vintage look of this cupcake liner garland from 100 Layer Cake. So, so pretty! Baker's Royale has a great idea to add a little pizzazz to your party snacks. 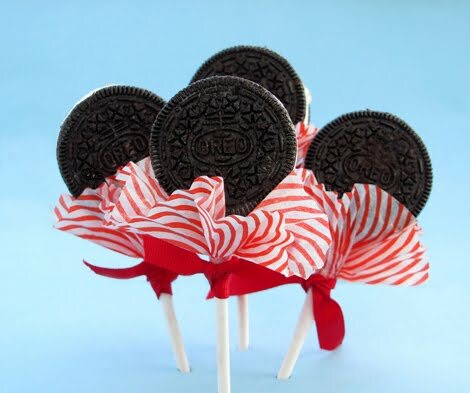 These homemade oreo ice cream sandwiches on a stick are embellished with a pretty little red cupcake liner. 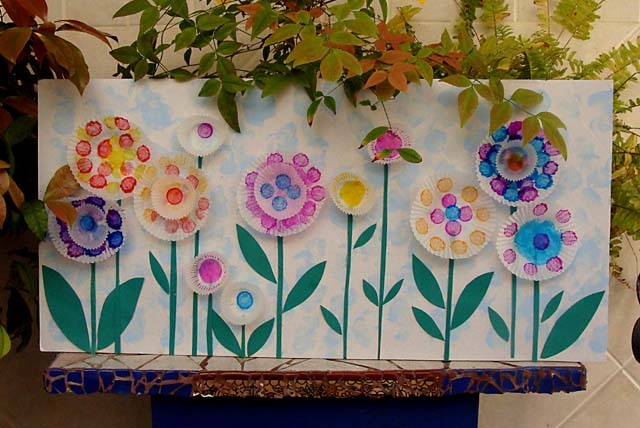 Creative Jewish Mom has two great ideas -- the first is is this terrific craft idea for kids - a field of cupcake liner flowers that they paint and decorate themselves. What a great party activity! And the next a sweet bouquet of paper flowers. 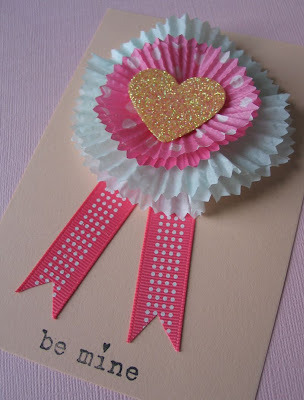 Perfect for a Valentine's teacher gift. 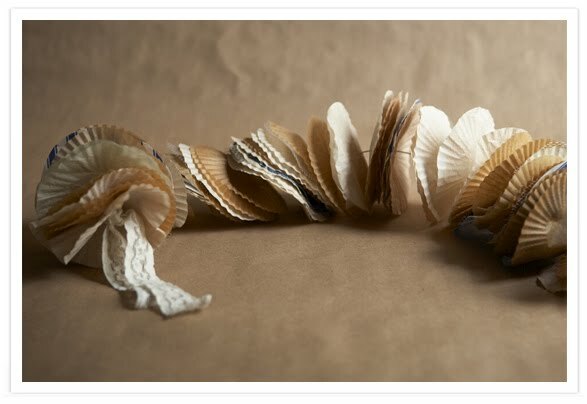 Ok, this one from Entertain Exchange might be a little more "pretty" than "practical" -- and a bit more "crunchy" than either of the above, but talk about creative! Can you imagine what your sweetie would say if you showed up for your Valentine's dinner in this little get up! Wow! I love all the ideas. I be trying a few of these out! 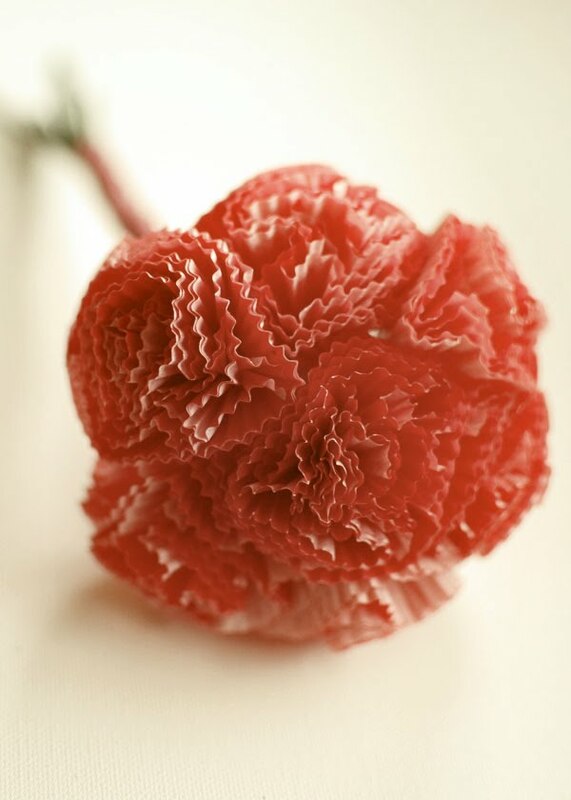 With all the pretty options there are nowadays cupcake papers really are a treat for the eyes...it makes me happy to see such creative and beautiful uses for them! Super CUTE!!! 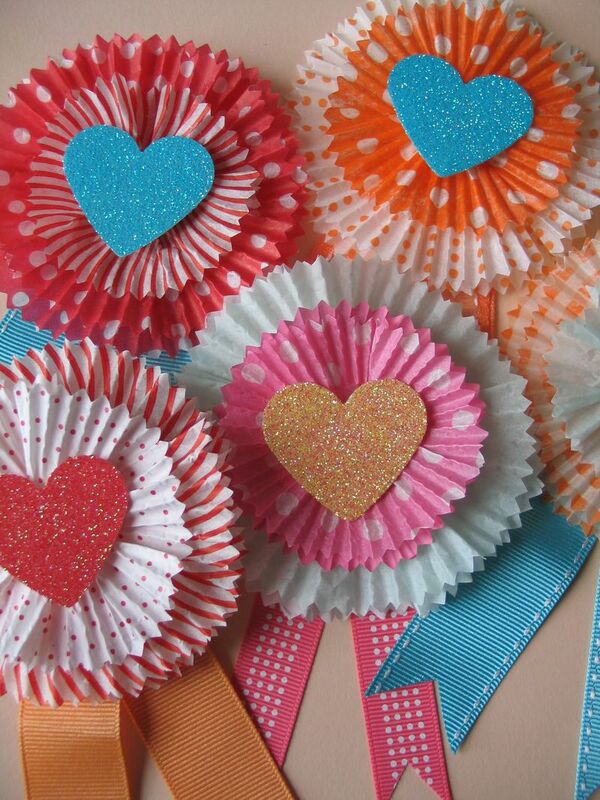 I'm going to have to jjump on a few of these Lovely Crafts! !